The Piper Super Cub, known as the PA-18, was originally engineered as an advanced version of the J-3 Cub. Its major differences were a bigger engine, stronger airframe, and wing flaps. This increased its payload capacity from about 450-lbs including fuel to 820-lbs. It also gave the Super Cub an increased cruise speed from about 65 to 100 knots. The Piper Super Cub has been around for 60 years, far exceeding any expectations that the Piper engineers ever had for it. It’s proven itself to be a worthy and reliable airplane, capable of taking off and landing in the most extreme places that no pilot would attempt in any other plane. It is for this reason that an entire industry has emerged over the years dedicated solely to the PA-18. 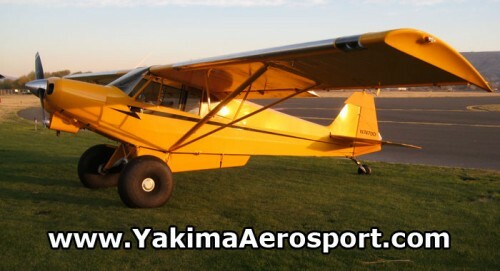 Yakima Aerosport is no exception. We’ve been flying Piper Super Cub airplanes since the 1960’s. We know everything there is to know about them, and they are the foundation of our business. We specialize in building original PA-18 Piper Super Cubs. If your Super Cub needs a frame-up restoration, we can do that. Fabric re-covers, engine work, and avionics upgrades are common procedures for us. We’re a trusted name when it comes to Super Cubs because the Super Cub is our plane! We’ve also been trusted by the Dakota Cub Aircraft company as the Northwest U.S. distributor for the Dakota Cub slotted wing. Yakima Aerosport is A&P and A&I certified and can perform any work you want done on your Piper Super Cub whether it be general maintenance or major repairs or upgrades.